Burning plagiarising students at the stake seems to be a major focus of the academic world these days, and I written about that elsewhere previously on this blog. In passing, I said I would discuss how I create assessments which are mostly proof against plagiarism. Creating assessments based on learning outcomes is a mugs game – all you are assessing is the outcome, but not the process, and students will find a way to shortcut to the outcome. Academics assume that an essay or paper of a specific length, with proper references based on assigned readings is a good measure of student learning. That process has several weak points. Second you hand out a book list, at the start of term. On this you may have flagged key texts or even worse, assigned a professionally produced textbook which flags the ‘key points’ in little coloured call out boxes or bullet lists. By now, you’ve closed the topic down so much that it isn’t an essay, it’s a very very simple jigsaw. It is carefully laid out so that any student with half a brain can get some sort of B grade (a 2.1 here in Ireland or the UK). Most of the thinking has been carefully squashed out in order to meet the desired outcome. Real world problems are not like that, and real research is not like that at all. Research base teaching in the humanities does not require huge lab resources, but it does require making students walk the walk of the research process. Location and evaluation of sources: The internet has made this more complicated than simply walking over the library and looking at the right bay of shelves but it has also made it more interesting since there are many more primary sources on the net now than formerly. I don’t hand out a list of criteria; I expect the students to find several lists of criteria on the web, and combine these into a list which they will use. I expect more than just a bibliography – I expect evaluation, and in some classes I push for a weighted evaluation where I ask the students not only to create their list of criteria, but also to weight those criteria – how many points will they allocate to publisher? to date of publication? to the status of the author? As I said, I don’t hand out lists of criteria, but I do model the work by devoting class time to searching using the library article databases or Google Scholar, flagging the article metadata and above all the web of references and citations. Share Reading summaries in discussion forums: There was a time when we made students write precis in every course; we seem to have slipped away from that. I don’t demand formal reading summaries, but I do require students to post on discussion forums the three points they consider most important from a reading, and the one they find most difficult. This has to be done in groups of at most 10 – if you set a whole class of 60 or 100 to read a single article, the first few will exhaust the interesting points and the later students will feel they cannot make any useful contribution. With 2-3 readings on any topic, in a group of 10, there is plenty of room for people to contribute. If the sequence works properly, I can use the online discussion to feed a plenary discussion at the start of class, which leads logically to introducing the next topic the next topic, and sets up the readings and online discussions for the coming week. Two parts of this are time consuming – getting the right sequence of topics and readings, and actually reading all or most of what they post in discussion every week. 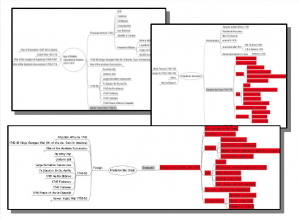 Mindmapping or other visualisation of the content of one or more sources: Quite a few students come to university able to read paragraphs, but not 20-30 page academic papers. They underline dates and facts, and miss the analytic structure of the reading. 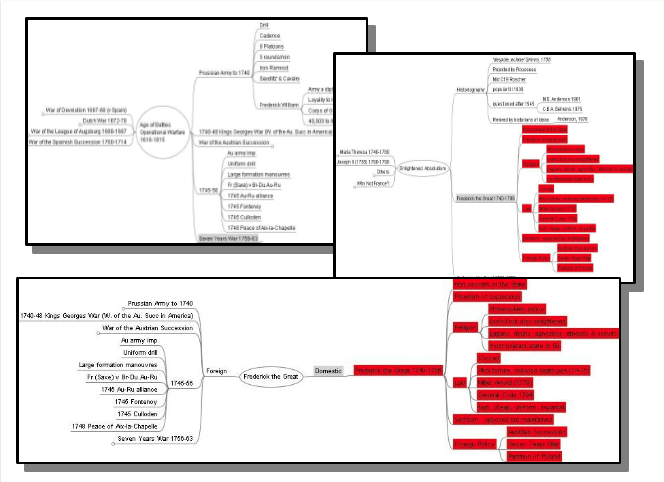 Requiring students to break down readings to mind maps is like reverse engineering the authors writing plan. 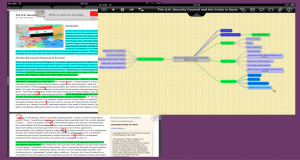 Doing it for at least three readings leaves you with elements which you can combine into your own writing plan – and if you do it digitally, you can create a workflow from mind map to essay plan to structured outline in a word processor. 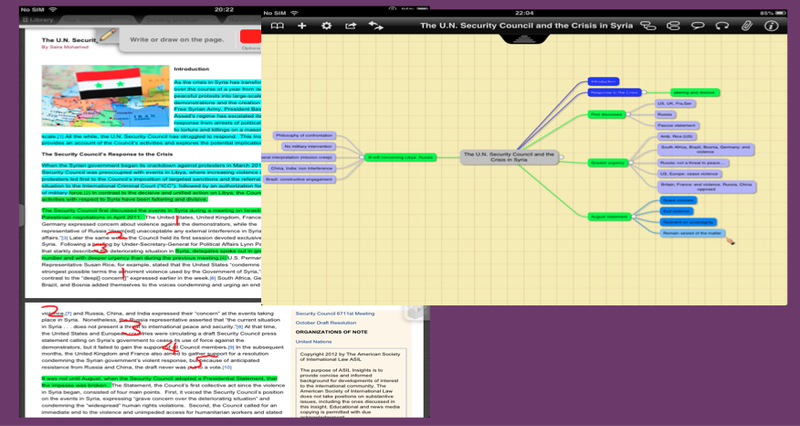 Most mind mapping tools don’t run on locked down university machines, so this is a class where I have to bring in my macbook, or iPad and step through from highlighting in a a pdf reader to creating a mind map of an article. Close Reading of Primary documents: If we can find primary documents, I include a close reading of a couple of pages. The easiest reading on doing this for history is Sam Wineberg’s book, Historical Thinking and Other Unnatural acts where it is applied to the Lincoln-Douglas debates Since these often come as pdfs rather than text, I have required typing a transcript and annotating it. Like everything else, this has to be demonstrated in class. I’ve spent quite a few hours reading through UN resolutions line by line on a projector in class to show students what to look for, and I do actually enjoy it. Chronology: History is my home field, and chronology is important – but it isn’t the be all and end all of writing in the discipline. I make students produce a chronology, but it must not be a simple list of dates and events – that might pass, but no more. I limit it to one page and require some sort of thematic structure. There are a number of reasons why I do this – the one page limit forces selection, which means choices about which facts are significant in the context of the topic they are working on. Demanding a thematic structure adds another layer of analysis. I have a growing collection of chronologies collected in powerpoint as examples of the visual presentation of ‘battles and dates’ and I end this session by showing them how to create a table in a word processor, and colour some cells if they want to add more analytic layers than just a bunch of columns. Essay Plans. I require essay plans, and when I do, I require three distinct plans, each on one page and no more. Again, there is a process of selection here, but also an impossible challenge: most students can come up with two different ways of approaching a topic, but coming up with a third is challenging. The final essay: No surprises here – except sometimes I don’t actually require the submission of an actual essay. This is partly a workload issue, since the rest of the portfolio adds up to a fair lot of work, and comes often comes out at about the page count of an essay already. Also, the portfolio does require a fair amount of explicit thinking about processes which the students skip lightly over in writing a conventional essay the night before the deadline. Omitting the essay, even though emotionally it feels like going into a bookshop and coming out without actually buying a book, also focuses attention on the steps in the research process. Almost none of this is content which my students can find on the web; and it will be quite a while before it becomes commonly available. I have a fairly large range of topics and readings and a growing collection of primary documents so I can keep ahead of what might be available to cut and paste. in fact, in some fields like politics methods courses, international relations or my digital humanities teaching, I can easily find fresh topics every year. I do not just do this to avoid plagiarism, but also to make explicit the steps in the research process that goes into writing a 1,500 to 8,000 word paper: – it’s research based teaching, where possible. It allows for – indeed requires – ‘flipped classroom’ work. It does take time in class to discuss what you expect in a chronology, and to look over the emerging work in the groups. It does not disregard the importance of content, but emphasises skills and methods for handling that content knowledge. This is a great outline of how to guide students through the research process. I agree that essays cannot be the only way of assessment, especially with the ease of plagiarism/buying them online, and in fact do not really prove that they learned much in a class.